Dental practices demand that infection control disposables deliver quality, consistency, ease of use and value. 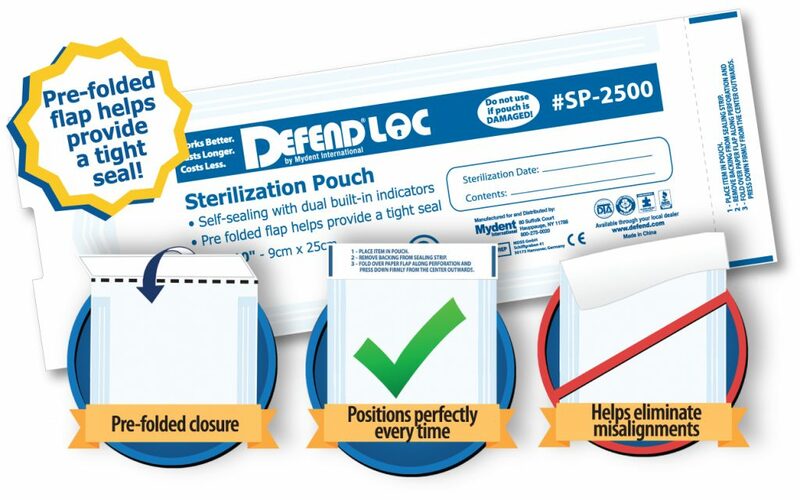 DEFENDLOC PRE-FOLDED Sterilization Pouches meet all of these criteria and more. Sometimes a minor design modification can make a major difference in product performance. DEFENDLOC is an example of that. Mydent’s popular Defend+Plus Sterilization Pouches are already known for their safety and structural advantages — yet Mydent has found a way to improve them with DEFENDLOC. The newly redesigned DEFENDLOC PRE-FOLDED Sterilization Pouch incorporates a patent-pending technology — making instrument sterilization safer, more effective, quicker, and virtually foolproof for the entire dental staff. Safer sterilization with a complete and uniform seal of the pouch. Quicker and extremely easy to make a perfect seal every time as compared to other competitive pouches. New pre-folded flap closure folds perfectly into place, eliminating time consuming flap adjustment and helping to ensure the best seal possible. This helps eliminate misaligned seals that can compromise sterility. Reinforced plastic pouch and rugged medical-grade paper guard against tears and perforations. Award-winning design and fabrication emphasize durability and ease of use. A strategically placed thumb notch simplifies pouch opening and instrument removal. Pouches are constructed with dual internal and external indicators that change color when the optimum sterilization temperature has been reached, both in the autoclave chamber and inside the pouch. Available in multiple sizes, this newly improved product is offered at the same low price as the original Defend+Plus Sterilization Pouch.